The Irish Gate is today represented by the curving footbridge that spans the A595 that cuts through the North of Carlisle. 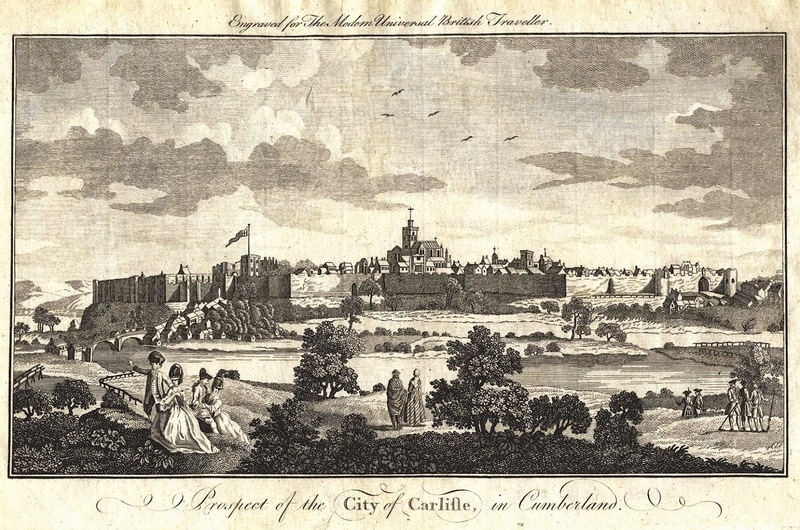 Also referred to as the Caldew Gate, it stood at the North West end of Carlisle, and opened out onto the bridge over the River Caldew. Above. View of the castle and Tile Tower from the site of the Irish Gate. It's interesting to note that the stone stair way at the South end of the gate contains little pockets of what could be original stone work....I'm only guessing though. From the footbridge, great views of the castle and Carlisle can be had, including a view up Abbey Street towards Prior Slees Abbey gatehouse. Above. The site of the Irish Gate as seen today. Above. The stump of curtain wall that would have abutted the Irish Gate. The photo above shows the stump where the Castle curtain wall used to continue onto the Irish Gate and then onto the West Walls. 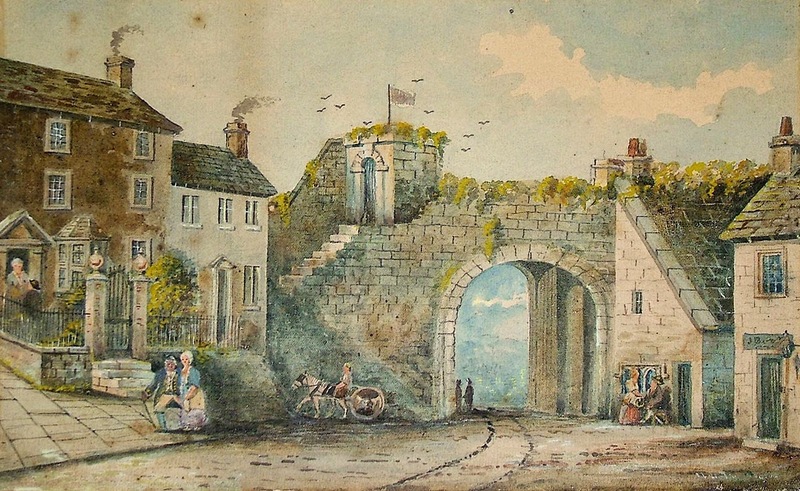 The gate was probably demolished in 1811. On the 27th of July 1315, the Scots besieged Carlisle in the wake of their crushing victory against the English at the Battle of Bannockburn. 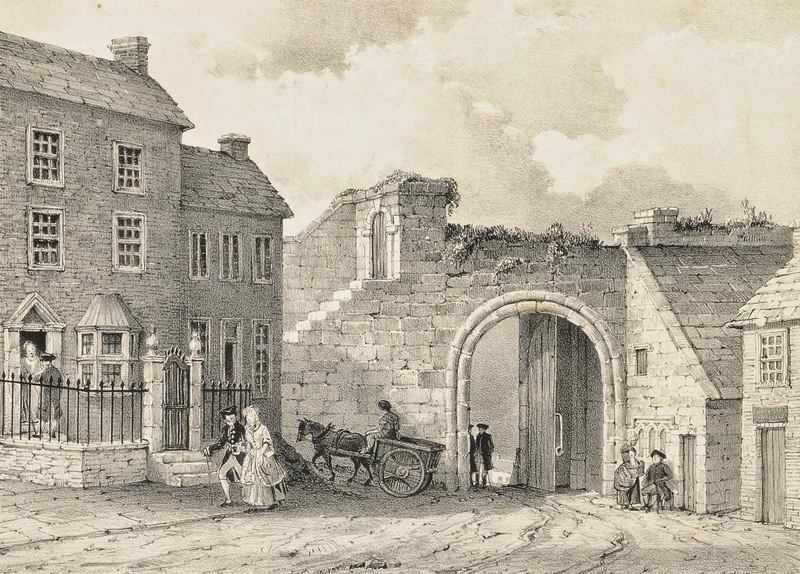 The Irish Gate came under direct attack according to the Lanercost Chronicle when the Scots "erected an engine and continually threw great stones towards the Caldew Gate, but did no injury." Some of the stones hurled at the gate were found in 1878 during building work on Annetwell Street. Above. 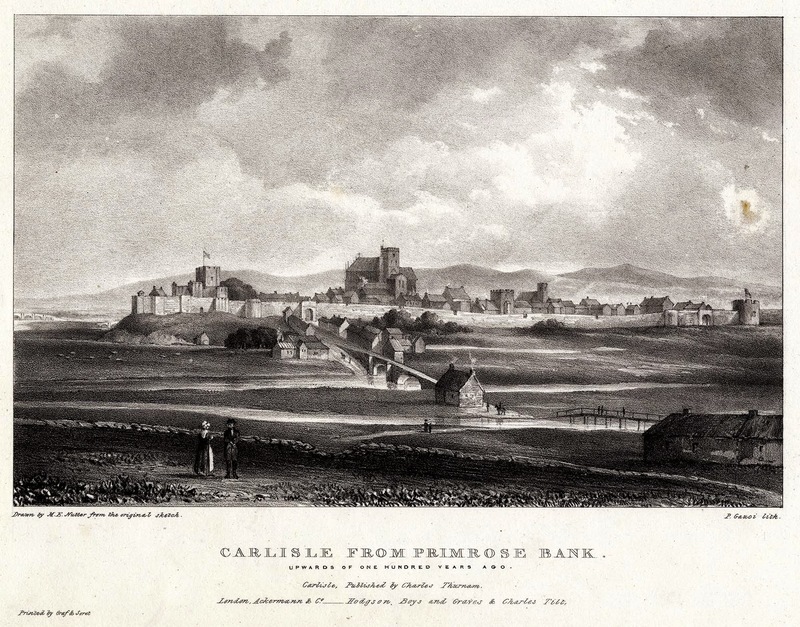 Panoramic view of Carlisle from the East of the city. Above. 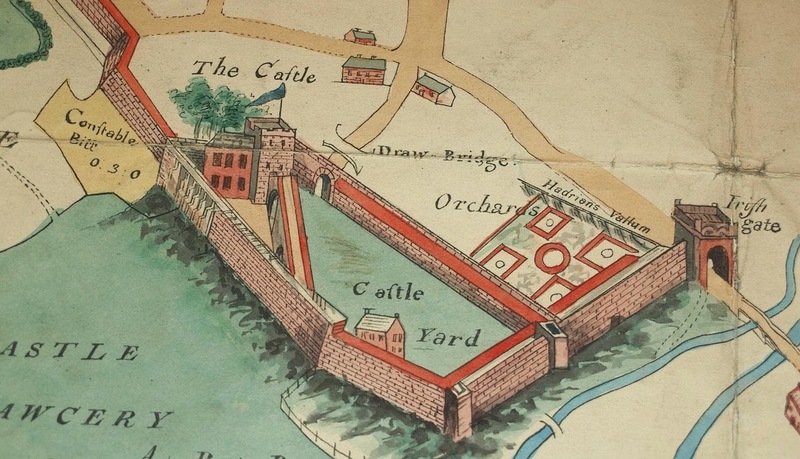 Old map showing the Irish Gate in relation to the Castle and its curtain walls. Above. Old etching showing the bridge crossing the River Caldew, connecting the Irish Gate. Above. 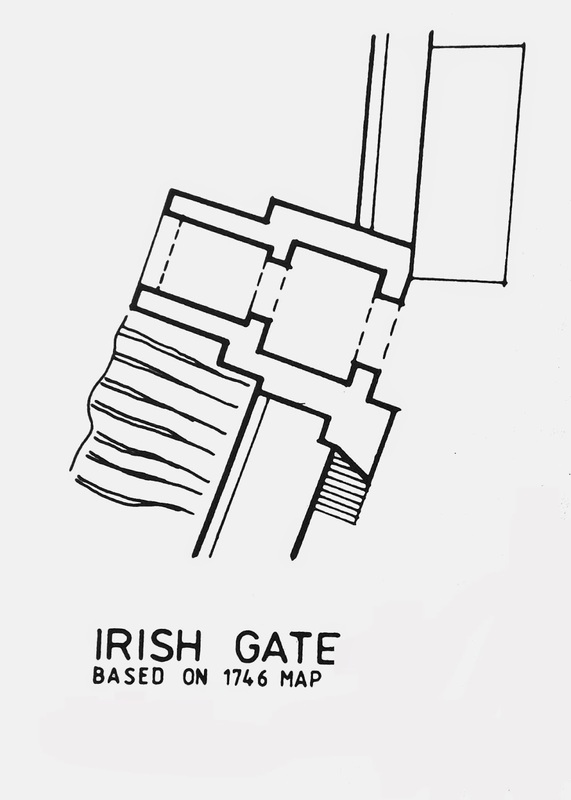 Plan view of the Irish Gate. 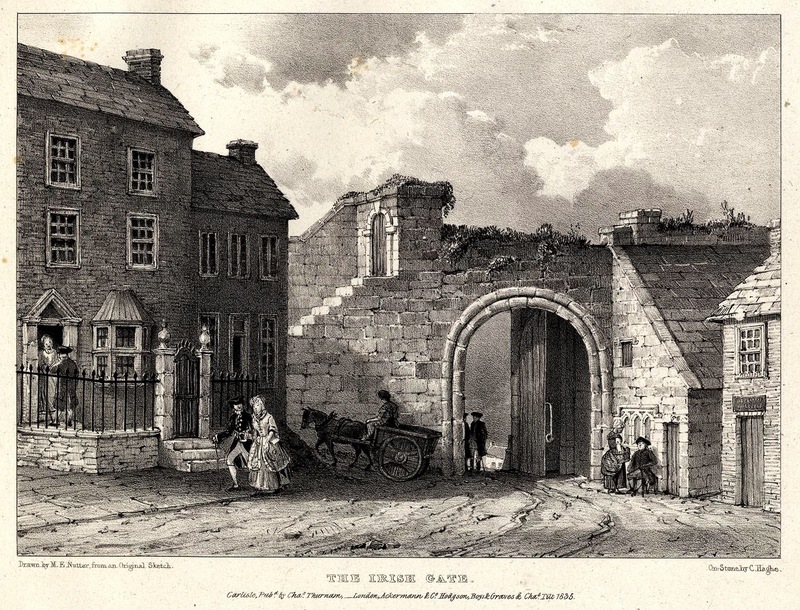 In 1385, it was reported to the Crown that the gates of the Irish Gate would not shut properly. Records suggest that it wasn't until 1428, 43 years later, that a grant of £80 was made for the repair of the gate and the adjacent walls. Again, this time in 1563, the gate was recorded as being in a poor state of repair. When Wolsty Castle near Allonby was demolished, Colonel Thomas Fitch, Governor of Carlisle, ordered that the doors from the castle be hung in Irish Gate, and other materials be used to repair the walls. As demonstrated in the plan view shown above, the Irish gate had a small barbican structure that covered a draw bridge that spanned the city ditch, possibly the same ditch that extended as far South as the Town Dyke car park near the Cathedral. 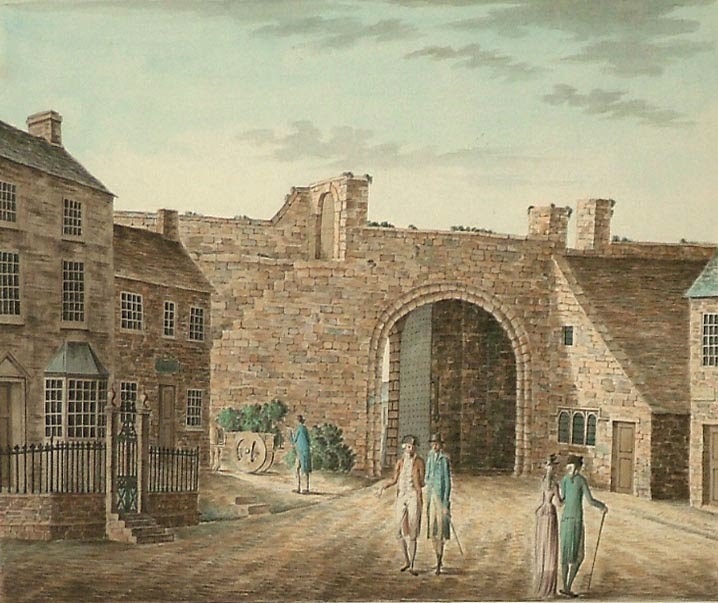 The gate was in good repair when Nathaniel Buck visited in 1738 to draw the walls and gates of Carlisle. In 1963 it was suggested that the Irish Gate should be reconstructed, allowing for the dual carriageway, but it wasn't until 1970 that proposals for a footbridge on the site were put forward. It would be another 30 years before the Irish Gate was reborn however, appearing as the sweeping curved structure that we see today.